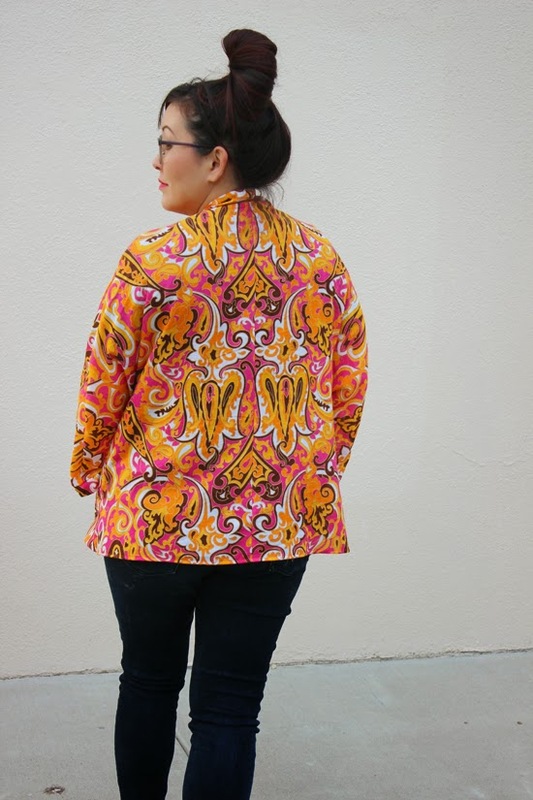 When I first saw the Tessuti Tokyo Jacket I thought it was a pattern I wanted to try. When Sallie, Amy, and Sophie blogged about their versions I KNEW it was a pattern I wanted to try. How stunning are their makes?!?! Unfortunately, I'm not completely stoked on my version :( I made it several weeks ago, took these photos two weeks ago, and have held off blogging about it to see if my thoughts would change. I'm still on the fence and decided to quit putting it off and write about it anyway! The beginning of the sewing process did not start off well for me due to taping the pdf pattern together. I was already grumpy while I was cutting and taping (in case your forgot, I HATE assembling pdf patterns), but when the pieces didn't line up correctly I was really annoyed. I also wasn't crazy about the fact that all the sizes were drawn the same with no differentiation between them. The Tokyo Jacket isn't the hardest to trace or cut out and I don't know if other Tessuti patterns are the same, but I could see it being an issue for more complicated projects. The sewing instructions were fine, but I still managed to mess things up. You see, and this is where I become a hypocrite, even though I hate wasting paper on pdf patterns (printing out and not needing to use all the pieces) I print out the directions. My sewing desk has limited space and can't accommodate a laptop and I genuinely do like to have a hard copy in front of me for current and possibly future use. Twenty three pages was too many to print in color, so black and white it was. Normally, I print black and white and don't think twice, but since the instructions were all photos (no diagrams) I considered doing color and didn't. Mistake. As a visual person I heavily rely on diagrams/illustrations, but because the garment in the photo instructions is made from a blue fabric with white polka dots it was harder for me to see what was going on and mistakes were flourishing left and right. A smart person would have looked at the pdf on the computer, but I was being lazy and stubborn and was forcing something when I just shouldn't have! I'm not going to go over all my mistakes I made because it's just going to get me worked up again haha. But they are there! Honestly, I haven't worn the jacket since I've sewn it which is unlike me and is a definite sign that I'm not loving the finished product. But who knows, maybe in a few months I won't take the thing off! The one thing I do like is the fabric. I bought it a few months ago when Rochelle and I went to Stonemountain in Berkeley, so it has good memories attached to it. 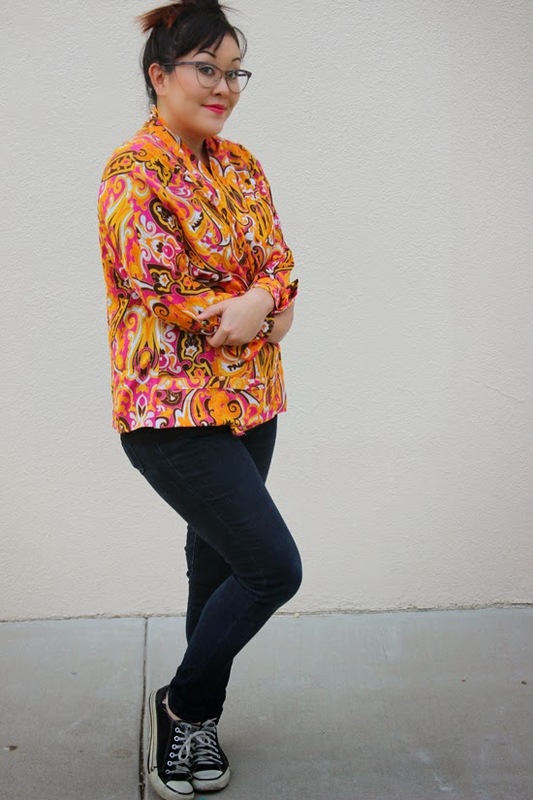 The print is fun and the viscose is so soft and comfy, I regret not buying more. So, my t-shirt. Have you guys heard of Night Riots? They are a local band and it has been really cool to see them grow and make good music. And it's super crazy to hear them on MTV. Love seeing nice and talented people living their dreams! I made that same pattern about 4 months ago and also have NOT worn mine either. I'm just not happy with the fit of the shoulders and sleeves and the overall look of it. Mine is a Viscose crepe and not as drapey as I would like. I also thought the pockets were a bit shallow. I may try it again in another fabric and perhaps make some adjustments. That kimono is the best kind of crazy! The fabric is woah, and also great. I think (hope) you'll like it better in summer? Feels like something to wear on a warm night out for drinks! Erin, that fabric is wonderful. I've been comparing your pictures to those of the projects you linked to and there are a couple of things that stand out to me. The hemline hits you at an awkward spot at the hip if it was a little longer/shorter it would hit you at a better spot. The other thing is sleeve length. Your sleeves are nearly at your wrist whereas the other projects are about mid forearm. I agree with Gillian, it would be great in summer over some jeans and basic black/white tank top. I think you're suffering from "I had trouble making this project so therefore I can't allow myself to love the finish product because I didn't love the process". I've had a lot of projects like that. They just feel tainted some how when you wear them, ya know? That's why I started making a muslin for EVERYTHING. If I end up hating the process of the muslin, even if the fit it okay, then I usually don't bother making it a second time in real fabric. I can't wear bad Juju haha! With that said, I really love this shape on you a lot and I LOVE the fabric so much!! I think you just need to hang it up for a little while and let yourself fall in love with it again. It really is very cute and very wearable! That fabric is gorgeous! I don't mind PDFs too much unless I then have to trace them as well (like named patterns) or add seam allowances. Tessuti patterns are all fairly basic. I've made a couple and they only usually have about 4 pattern pieces. If the patterns were more complex the lines would be an issue. I find I always haven. Count along to make sure I'm on the right size line. I hope you grow to like your jacket because it is really pretty. First off, the fabric is awesome! Second I like the way it looks on you. 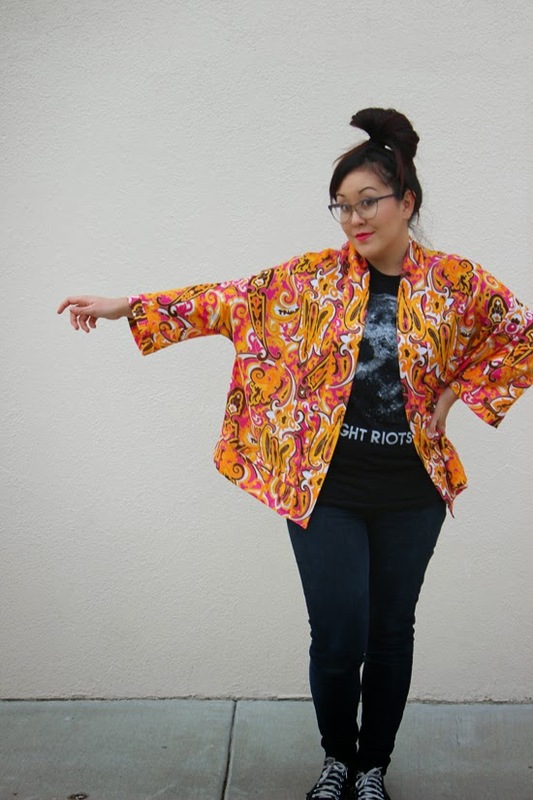 I made a kimono style jacket a couple months back and have never worn it or blogged about it. I don't like the way it looks on me but I love the way they look on everyone else. I do hope you change your mind and get lots of wear out of this. The fabric is just too awesome. If I were you I'd try it again in something more subdued. 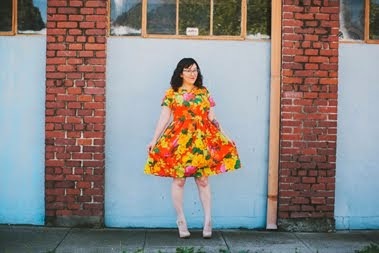 All the versions you linked to were drapy fabrics in subdued colors, so I think you might be experiencing some disconnect between what you like to look at vs what you like to wear. In all these pictures you look uncomfortable... If I were you I'd wear this as a cover up over a camisol and my cat pajamas while I drink my morning coffee. This way I'd make this about comfort and less about fashion. I like it!! It's such cool fabric! I hope you wear it, maybe you'll grow to love it with wear!! I think this is crazy cool!! I really like this on you! It's super fun! Also, I could imagine a knit version of this being really cozy and nice for cooler weather. Oh I'm so sorry you didn't have a happy experience! That fabric is great so maybe that will be the thing that lures you back round to wearing it? This fabric is a dream! I'm sorry to hear you had so much trouble with the PDF - that would have driven me crazy too. I'm not a fan of photographs in sewing instructions for that exact reason. I actually think illustrations are clearer and easier to follow. 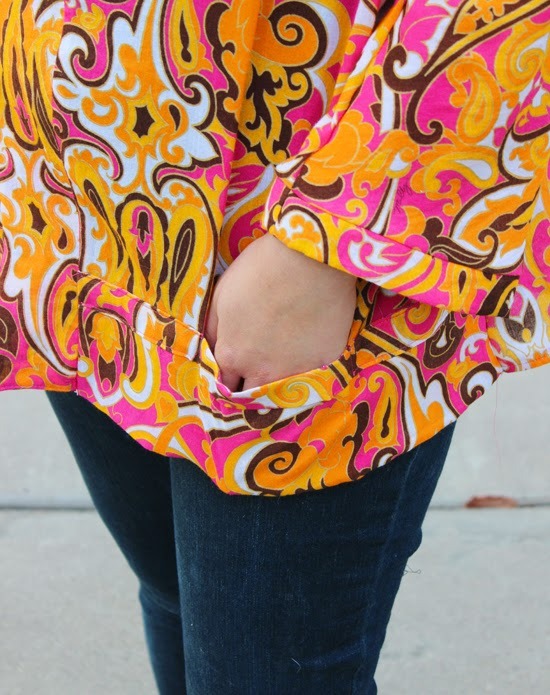 I hope you find a good use for this jacket... or at the very least, cut it up and salvage the gorgeous fabric!